I feel like Hate List is the type of book I was wanting to experience whenever I read the book This is Where It Ends (don’t even bother, IMO). And I couldn’t help but notice other people saying that too, so that made me feel better. Hate List did such a superb job at going into what it’s really like for school shootings and even what the after math was life. Sort of like when I read We Need to Talk About Kevin. I really crave that with these types of books and have only came across a couple that does so well at going beyond the tragic event. I want to know everything and I want to know how everyone is affected. The author did a fantastic job writing that. I couldn’t have asked for anything more. I truly felt like Valerie was a very well wrote character that I had no problem at all relating to. Seeing it all from her POV, was completely enthralling to me. I never once questioned her feelings or the way she approached things and I felt more for her than I have any other character in this book. My only complaint was that I really wanted to see more of her life “before”. We get some of that in the book, but I still wanted more. I can’t tell you why. I cannot stress how much I loved seeing the development for ALL of the characters within this book. Not just Valerie but her classmates, her family, just everyone around her. It was so amazing seeing all of this unfold and seeing them change as the weeks went by. Adjusting, growing, healing. All while still trying to focus on what they needed to focus on. It wasn’t easy, so seeing that made the experience of the book that much better for me. I didn’t care for the abrupt ending. I kind of just turned the page and bam, it was over. Big pet peeve of mine. Like, WHAT?! Wait, I wasn’t done! Don’t do that to me! Please come back! 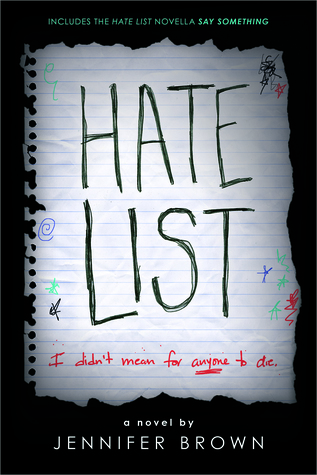 If you are looking for a book that is completely powerful and never stops making you feel something- you need to read Hate List. I don’t think I ever stopped feeling a feeling through out the entire book. If it wasn’t one feeling it was another. That is so much fun to me, feeling different things throughout a story. I like it when a book keeps me on my toes.